Jane graduated from the Royal College of Music with a first-class honours degree in the B.Mus. programme. She is also an award winner of the Martin Musical Scholarship Fund. 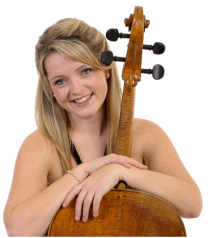 She is rapidly developing a reputation as an exciting and compelling performer, appearing both as soloist and chamber musician at venues including the Wigmore Hall, Purcell Room and Cadogan Hall, as well as at major festivals across the UK and Europe.